Brooklyn studio Interboro Partners have won this year's MoMA/P.S.1 Young Architects Program competition to design a temporary installation in the courtyard of the P.S.1 Contemporary Art Centre in New York. The installation, entitled Holding Pattern, will feature a twisted rope canopy stretched over the courtyard. The space below will feature benches, mirrors, ping-pong tables and floodlights, creating a temporary urban landscape where the MoMA/P.S.1 Warm Up summer music series will be hosted. Holding Pattern will open in June this year. MoMA and P.S.1 are also partnering with the Zaha Hadid-designed MAXXI museum in Rome to create the first international edition of the Young Architects Program, with Italian studio stARTT chosen to create an event space in the museum's piazza. More information to follow. See last year’s installation by SO-IL in our earlier story. NEW YORK, February 16, 2011—The Museum of Modern Art, MoMA PS1 announce Interboro Partners of Brooklyn, NY, as the winner of the 12th annual Young Architects Program in New York. Now in its 12th edition, the Young Architects Program at MoMA and MoMA PS1 has been committed to offering emerging architectural talent the opportunity to design and present innovative projects, challenging each year’s winners to develop highly innovative designs for a temporary, outdoor installation at MoMA PS1 that provides shade, seating, and water. The architects must also work within guidelines that address environmental issues, including sustainability and recycling. For the first time, MoMA and MoMA PS1 are partnering with another institution, MAXXI in Rome, to create the first international edition of the Young Architects Program. 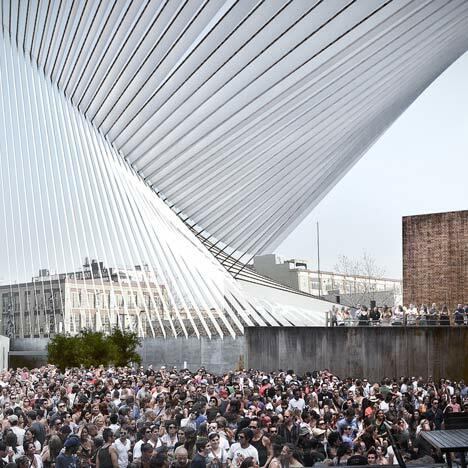 Interboro Partners, drawn from among five finalists, will design a temporary urban landscape for the 2011 Warm Up summer music series in MoMA PS1’s outdoor courtyard. Interboro Partners’ Holding Pattern brings an eclectic collection of objects including benches, mirrors, ping-pong tables, and floodlights, all disposed under a very elegant and taut canopy of rope strung from MoMA PS1’s wall to the parapet across the courtyard. Creating an unobstructed space, the design incorporates for the first time the entire space of MoMA PS1’s courtyard under a single grand structure, while creating an environment focusing on the audience as much as the Warm Up performance. A key component of the theme is recycling; objects in the space will be donated to the community at the conclusion of the summer. The designers met with local businesses and organizations including a taxi cab company, senior and day care centers, high schools, settlement houses, the local YMCA, library, and a greenmarket to determine what components of their installation could be used by those organizations following the Warm Up summer music series. Incorporating objects that can subsequently be used by these organizations is a means of strengthening MoMA PS1’s ties to the local Long Island City community. The other finalists for this year’s MoMA PS1 Young Architects Program were FormlessFinder (New Haven, CT/Brooklyn, NY, Julian Rose and Garrett Ricciardi), MASS Design Group (Boston, MA, Michael Murphy), Matter Architecture Practice (Brooklyn, NY, Sandra Wheeler and Alfred Zollinger), and IJP (London/Cambridge, MA, George L. Legendre). An exhibition of the five finalists' proposed projects as well as YAP_MAXXI’s five finalists’ proposed projects will be on view at MoMA over the summer. It will be organized by Barry Bergdoll, MoMA Philip Johnson Chief Curator, with Whitney May, Department Assistant, Department of Architecture and Design, The Museum of Modern Art. Klaus Biesenbach, MoMA PS1 Director and MoMA Chief Curator at Large, adds, “MoMA PS1 is very excited about the innovative architecture of Interboro, which describes the famous MoMA PS1 courtyard as one architectural volume, especially since the YAP 2011 opening will coincide with the much anticipated opening of the new MoMA PS1 entrance kiosk by Andrew Berman Architects."